Have you heard about Pinterest? It's this super-neat site that has been a huge source of inspiration and fun for me since I joined. It's like an online corkboard where you can 'pin' things you like onto your boards. When it works, it works beautifully (though it has its share of downtime and bugs). 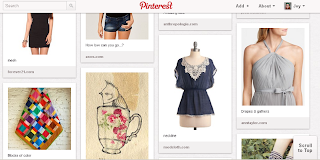 I've been using it to pin things I admire, craft tutorials I want to try, and inspiration for new designs. It's like creating your own design mood board - absolutely a fantastic creative resource. Plus, you can follow people whose style you like and see everything they're pinning. I just recently found pintrest and would love an invite!